Welcome to Question Time with kessie! Ask away. Edited by Makaze, 08 December 2013 - 01:20 PM. 1-Your favorite internet meme and why.? 2-On a scale of one too lord of the rings how much do you walk per day ? 3-If you could kill any nitendo character who would it be and why ? 4-You just won the lottery what would you do with the money ? If you could choose to live and settle down anywhere in the world where would it be and why? Edited by Sloan, 09 December 2013 - 12:16 AM. how long can a mistake last as a mistake? do you believe in god(s)/goddesses? is there any form of true peace in this world? can I ask you more than 5 questions? Edited by disastrousmaster, 09 December 2013 - 02:32 AM. What is your favorite branch of natural science and favorite branch of social science and why? Oh wow. I didn't even know this was here. I got a message from Makaze about it but I had no clue what Makaze was talking about XD sorry everyone! 2. I would want to live in the DC universe. Superheroes are awesome. 3. My old roommate. I couldn't stand here. 4. I would want to be like (though not look like) Orson Scott Card. I want to be an author that gets a movie. 1. (in order of favorite to least favorite) Attack on Titan, Code Geass, HunterxHunter, Fullmetal Alchemist, D Grayman, Ao no Exorcist, Magi, Fairy Tail, Ouran High School Host Club, Maid-sama!. 3. Lelouch vi Britania, Tyki Mikk, Levi, Rin Okumura, Aladdin. Rhode Kamelot, Hanji, Izumo, Eve, Gasai Yuno. 4. Hoshino (D. Grayman) for art, Yochihiro Togashi and Hiromu Arakawa (Hunter x Hunter and Fullmetal Alcehmist) for story and character development. 5. Branch of sin (Deadman Wonderland) Geass, Tease/Choose (Tyki's power in DGM), Blue Flames (Ao no Exorcist), Flame Alchemy. 1. 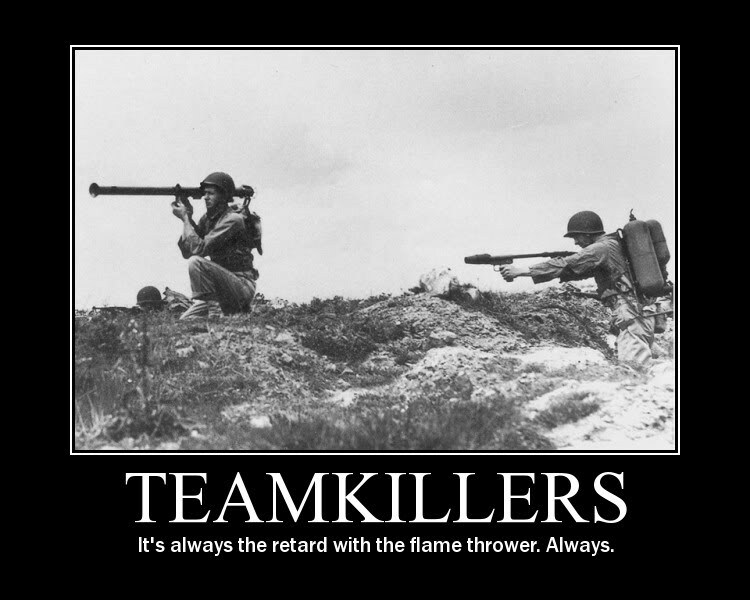 I like the Teamkiller demotivation with the flamethrower. 2. 7 probably. I have a big campus. 3. Mario. I hate those games. 2. Georgia. It's warmer there and they have peaches. 3. Orlando Bloom, Liam Hemsworth, and Jesse McCartney. 4. Kessie. It's short for Kesaria, one of my DND Online characters. She's a level 8? Elementalist Wizard. 1. That healthcare should be a privilege not a right. 2. Will I have a job and not live in a box? 3. I like Genetics (Genetic Engineering major here) and Psychology. 4. I think we go to the spirit world to wait for resurrection. I try and do my best to be worthy of going to heaven. Attack on Titan, Code Geass, HunterxHunter, Fullmetal Alchemist, D Grayman, Ao no Exorcist, Magi, Fairy Tail, Ouran High School Host Club, Maid-sama!. 6. Do you read Big 3 then? If yes top 5 characters of each? Lelouch vi Britania, Tyki Mikk, Levi, Rin Okumura, Aladdin. Rhode Kamelot, Hanji, Izumo, Eve, Gasai Yuno. 7. I know all the male but none of female ones. Which manga are they from? 8. 3 most original manga you've read and want to recommend for people? 9. Top 5 most beautiful manga female characters? 10. Your favorite novel(s)? Of any genre. 11. Top 5 characters of HxH? FMA's? 6. I kind of read the big 3, but mostly Naruto (kind of familiar with Bleach too) and only because I've spent enough time reading it that I might as well finish it. Aizen, Grimmjow, Ulquiera (sp), Kakashi, Asuma. 11. Hisoka, Killua, Gon, Merium/The King (sp? ), Pitou. Mustang, Ed, Selim, Riza, Greed. Edited by kessie, 13 December 2013 - 12:30 AM.